I've finally managed to write a short story for the Oescienne series, and I've settled on a title for it: Conquer the Castle. It is also now FREE on Smashwords if you prefer to view it on your ereading device instead of here. But, before you do, here is a quick blurb: Jahrra and her friends are about to embark upon a very important mission: to steal the flag of their nemesis, Eydeth, in a city-wide game of Conquer the Castle. Will they be able to outwit and out-maneuver their other classmates in order to win the grand prize, a day off from school? Or will the twins once again make Jahrra the laughing stock of the whole school? Conquer the Castle is an adventurous, and sometimes humorous, short story from the world of Oescienne. It was a stupid question, Jahrra knew that, but she cringed as she held up the old, age-yellowed shirt and leggings. Where on Ethöes did he get these? she wondered. They looked like something a noble would have worn a hundred years ago. As Jahrra contemplated the antique clothing, her guardian walked through the dragon’s entrance of their home, blocking out the light for a moment as he came to stand over her. “Your teacher’s note said old, white clothing,” he said blandly when he saw what she was doing. Jahrra sighed heavily and started digging through the trunk again. She could use some of her own clothes, but she didn’t want them to get stained in the game of Conquer the Castle she and her classmates would be participating in the next day. She would have to make do with what she found in the trunk. It held not just the two pieces she had found earlier, but an entire wardrobe of garments, nearly all of them well-tailored and of a high quality. They ranged greatly in size, but none of them were so big that she couldn’t fit into them. She also realized that they were boy’s clothes since there wasn’t a single dress among the lot. Thank goodness, she thought. She leaned back on her knees and studied the pile from a short distance. Yes, where had her mentor acquired these clothes? At first glance she had assumed they were costumes. Of course, why the dragon Hroombramantu would have costumes was just as puzzling as why he might have a wardrobe more fitting for a Nesnan or Resai elf. He nodded towards the long white shirt and leggings Jahrra had set aside before he’d come into the room. Jahrra’s eyebrows arched at that. Jahrra held up a rather gaudy short coat, sewn from dark green velvet and embellished with golden thread and beads. “And were some of your past pupils royalty?” she teased, flapping the coat about in a haughty way. The slight twitch of Hroombra’s mouth could have been rather telling, but before Jahrra could decipher whether it was an acknowledgement of her statement or a mere reaction to something he found humorous, a familiar voice called from outside. Jahrra dropped the coat onto the unkempt pile and raced for the door. “Yes!” she answered as she met her best friend, Scede, at the door. Gieaun, his sister and her other best friend, was just behind him. “Did you find anything to wear for tomorrow?” he asked, crossing his arms and trying to peer over her shoulder. “Ugh,” Jahrra moaned as she rolled her eyes and grabbed his sleeve, pulling him outside to join Gieaun. As the three friends rode their horses in the direction of the Wreing Florenn, the forest that loomed just beyond the old ruin where Jahrra and Hroombra lived, they animatedly discussed the plan for the following day. Professor Tarnik, their stodgy, overbearing boor of a teacher, had decided to test their survival skills this year by pitting them against one another. Conquer the Castle, a competition where the goal was to steal the banner from another team’s camp while trying to protect your own, was his idea of examining how they would fare should they find themselves lost in the wilderness. Jahrra didn’t think it was the best way to test their survival skills, but the anticipation of a good competition kept her silent on the matter. “Obviously so the dye will show up Gieaun!” Scede said, giving his sister a perturbed look. They hadn’t been given too many details about the rules of the game yet, but they had been told it would involve crossbows, soft-tipped arrows, dye pouches and white clothing. The class had already been divided into five teams of six, and they knew that they had the entire city of Aldehren as their battle ground, so long as they avoided the townspeople during their game. “Like Eydeth and Ellysian would even notice a local shop owner if they tripped over him,” Gieaun sniffed. “They would if it made them easy targets,” Scede countered with a mischievous grin. That made Jahrra snicker, for there was nothing better, in her opinion, than having a good laugh at the twins’ expense. Eydeth and Ellysian had been tormenting her since she was small and it had become second nature for her and her friends to blanch whenever their names were brought up. Soon the three companions spotted a tangled bramble growing on the edge of the forest and all talk of the evil Resai twins and their unpleasantness was over. Jahrra climbed down from Phrym as soon as they reached the bramble patch and sighed with glee. The bushes were heavy with a dark purple berry. Archedenaeh, the enigmatic Mystic who lived in the center of the forest, had once shown these berries to Jahrra and her friends. Jahrra, Gieaun and Scede had gathered some of the white mud near the creek the day before. Now all they had to do was mix in the right amount of berry juice to make the pasty paint the same violet shade as the banner they were charged to protect in tomorrow’s grand battle. 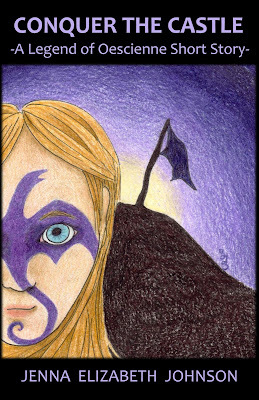 “What should we paint on our faces?” Gieaun asked, wrinkling her nose at the dollop of purple mud on her fingers. By sunup the next morning, Jahrra, her friends, and all their classmates were crowded around the schoolhouse in Aldehren, patiently waiting for their teacher to show up and get the game started. Kihna, Rhudedth and Pahrdh, the other three members of Jahrra’s team, moved over to the edge of the crowd to join them. “So, what did we decided to do for the war paint?” Pahrdh asked over his sister’s head. Rhudedth rolled her eyes at her brother and mouthed the word boys which resulted in a giggle from Gieaun and a snort from Jahrra. They quickly moved a few more feet away when someone from the green team glared at them. Kihna peered over everyone’s shoulder and arched a brow. Jahrra had drawn a crude face with two dragon wings covering the person’s eyes like a mask. The dragon’s neck curled onto the forehead and the tail trailed around one cheek and ended at the person’s chin. Face paint wasn’t necessary for the game of Conquer the Castle, but all six teammates had agreed it would be a nice touch. “How are we going to paint that image on our faces?” Kihna asked when she was done studying the picture. Jahrra grinned. “With this,” she said, pulling out a jar of the dyed mud. Fifteen minutes later, all six of them were sporting their dragon masks and Professor Tarnik was getting ready to read the rules. Several parent volunteers stood around him, holding canvass bags and small crossbows. As Tarnik cleared his throat, they started moving through the crowd of children, handing each one a crossbow and a bag full of arrows. Another adult had a sack full of paint packs for the soft-tipped missiles. When the team leader held up their banner, they were handed several of the paint packs in that flag’s color. This drew a few snickers and giggles from those nearest Ellysian, but Jahrra just ignored them. She knew they would make fun of her team ‘uniform’, but she didn’t care. She was here to win the game, not compete for first prize in a fashion contest. Ellysian, of course, was wearing a brand new pair of fashionable white riding pants and a shirt and coat to match. Jahrra sighed and waited patiently for their turn. The parent volunteers who were handing out their crossbows and arrows would also be monitoring the game; making sure all the rules were followed. Jahrra was grateful, for she knew of a certain set of twins that was prone to cheating in order to get their way. She gripped the wooden pole of her team’s purple flag tightly. No one, especially not Eydeth and Ellysian, was going to capture her team’s banner. Jahrra shot a glance at Eydeth and Ellysian and the smug looks on their faces waned just a little bit. Ellysian leaned in to whisper something in Eydeth’s ear and his look turned even sourer. Had her instincts been right? Had they been planning something? Will be a bit hard now, Jahrra thought with some satisfaction, what with referees walking about to make sure all the rules are followed. Jahrra filed the information away. Fifty points for each flag captured, one point for each time you hit someone, three points taken away for each time you are hit. Got it. Tarnik lowered the scroll he’d been reading from and scanned the crowd with his eyes. Jahrra could have sworn that he sneered when he spotted them, but soon he was done with his surveying. Jahrra listened intently as he explained that each team had a territory already marked with smaller ribbons to match the color of their flags; territories that they must find themselves. This should be interesting, she mused with anticipation. She delighted at the thought of the free-for-all that would ensue once everyone scrambled to find their territories while avoiding being shot by the enemy. Everyone cheered, declaring that they were more than ready to begin. He reminded them once more to stay out of the way of the townspeople and to not wander any further than a hundred feet away from the edge of town. Everyone bolted at once, shouting and scrambling to get to their respective territories, wherever they might be. Jahrra and her team headed south, since it was the only direction no one else seemed to be heading. “Might as well check in this direction first and avoid getting shot,” Jahrra breathed as she and her friends jogged down the cobblestone road. The town was still relatively quiet at this hour, but as the six friends scanned the side streets and patches of trees and bare hillsides for purple markers, the people that were out and about paused to watch their progress. Some even wished them luck in their game. Jahrra grinned. She hoped that their classmates’ antics would prove entertaining for those who had to put up with their entire town being invaded. Jahrra grinned as she spotted the violet ribbon dancing in the breeze. They had made the right decision in going south. Soon, the six of them had established the edge of their territory. It included part of a city block and a sizeable amount of a small, forested hill rising up behind a row of buildings. Jahrra held her hand to her eyes, squinting hard as she looked for a good place to place their flag. “Let’s see if we can find a place where we can blend in with the surroundings,” she said. “It’s going to be impossible to blend in wearing white Jahrra,” Gieaun pointed out. Jahrra sighed in frustration. Gieaun was right and any minute the other teams were going to find an appropriate place to hide their flags and be on the hunt. Although their territory was large and there were plenty of suitable places to put their flag, Jahrra and her team were having trouble picking a good location. Jahrra shaded her eyes again and glanced between the buildings in the center of their marked territory. Her gaze trailed down the alley between two buildings, then up the leaf-littered hillside behind them. The buildings were the typical small business establishments found throughout Aldehren with the lower floor sporting a shop while the upper story acted as the living quarters. A railed deck wrapped around both buildings, and trailing from the edge of the deck into two redwood trees on the hill was . . .
Jahrra grinned. “Perfect!” she cried. “Already found it. Look.” She pointed up to the hillside and then to the lines running from the trees to the decks, the ropes sagging with the weight of freshly hung sheets and random articles of clothing, many of which were white. “Excellent!” Pahrdh cried out with glee, already sprinting towards the alleyway, the violet banner flapping behind him. The six of them quickly clambered up the hill and drove the flag pole into the ground. Jahrra ran back down onto the street to make sure the flag was visible enough to be seen by her classmates, then rejoined her friends on the hillside. From the center of the hilltop, they could just see over the rooftops of the buildings in front of them. He pulled out a sizeable chunk, nearly two thirds of his supply. Scede, Rhudedth and Jahrra followed suit. Jahrra didn’t sacrifice as many as the boys had; she had a special purpose for some of her own arrows. Gieaun nodded grimly and accepted the arrows and extra dye pouches from the boys, dividing them between her bag and Rhudedth’s. Once they were well armed, Gieaun secured the bag of arrows and extra dye to her back, then turned and started climbing the tree, muttering protests as her hair got tangled in the redwood’s needles. Kihna was already jogging to the other tree with her bag of ammunition. “How’s the view from up there ladies?” Scede called up to Kihna and his sister. “I can see everything!” Kihna cried out. Jahrra nodded her head in agreement. Three points wasn’t much, but multiply that by fifteen or even ten, capturing another team’s flag might not garner enough points to win the game. Oh, and Jahrra was determined to win this one. Even more so, she was burning to capture the golden flag belonging to a certain set of twins and their team. “And I’m going for the gold,” Jahrra said with an air of vengeance. “We wouldn’t dream of taking that honor from you,” Scede claimed, standing up straight and placing his closed fist over his heart in a gesture of obeisance. Jahrra shoved him good-naturedly and in the next minute they were creeping down the hill to start the hunt. “Be careful and good luck!” Jahrra called quietly to her teammates as they all took a different direction away from their base. Although they had decided leaving two people behind to guard their ‘castle’ while the others used stealth and skill to sneak into the enemy camps was their best option, Jahrra felt nervous. She didn’t think it would be the easiest way, but she was hopeful nonetheless. Casting aside her wayward thoughts and sending up a plea to Ethöes that her friends fulfilled their own goals, she crept back through the city, staying close to the backs of the buildings and using the occasional wooded hillside to hide her progress. She had caught a glimpse of Eydeth and his team heading northeast when they had first dispersed, but Jahrra couldn’t be sure that’s where they’d find their territory. She decided that a surreptitious check of the city’s perimeter would give her some answers. She bristled in annoyance when the edge of her shirt snagged on a branch fifteen minutes later, drawing the attention of someone on the red team. She wasn’t fast enough to dodge the arrow they sent her way, and as she dove behind a tree, the tip of the arrow caught her hip. Gritting her teeth in annoyance, she moved quickly and silently further up the hill to get out of sight. She would have to be more careful in the future. An hour passed before Jahrra finally caught a glimpse of something promising. She had descended back into the city, keeping to the shadows of the buildings. At one point she used a passing cart to disguise her movement, ducking behind it as it rolled past a clump of her classmates, all three of them armed with green-tipped arrows. She quickly ducked behind a building to wait for them to move on, but as she was waiting a splash of yellow caught her eye. Jahrra jerked her head to the left and spotted a yellow ribbon tacked to the corner of the building she was using for cover. Feeling her heart leap into her throat, she swallowed hard and crept closer to the edge of the small shop. Another yellow strip of cloth was nailed to the corner of the city’s stable several feet away. Got you Eydeth, she thought as her eyes narrowed. Now, all she had to do was locate the flag without being seen . . .
Jahrra peeked around the corner of the building once more, and then she saw it. There was the golden flag she sought, waving gently in the breeze as if beckoning her forward. She was tempted just to run for it. Taking time to check the area for guards could draw their attention, but if she just bolted, maybe she could use the element of surprise. Sweat dripped down her forehead and stung her eyes. She gritted her teeth. It was so tempting just to run . . . But she had already been shot at twice, hit once, and she couldn’t risk acting before checking her surrounding area. Patience, she told herself, patience . . . Forcing herself to keep still, Jahrra carefully looked around the building again to assess her options. Eydeth and his team had chosen well. Their flag, tied to a long, sturdy branch like all the other banners, was standing in the middle of an abandoned pasture behind the stables. Several rocks were piled up to keep the pole from falling over and most of the pasture was surrounded by a neglected yet sturdy fence. Clever Eydeth, Jahrra mused wryly. Although the spare pasture was obviously not suitable to keep in horses, there was still plenty of good fencing to create an obstacle for anyone hoping to make a mad dash for the flag. Jahrra narrowed her eyes and scanned the entire fence line. The most obvious entrance was several yards in front of her, where the gate had been left wide open. She spotted a few more gaps in the fence where a rail had fallen down, creating a hurdle. Those neglected areas wouldn’t be as hard to get past as a solid fence, but it would be just enough to slow someone up and make them vulnerable for an ambush. So, Jahrra thought as she finished her assessment, you hope to lure us in and then trap us like sheep? Jahrra would be very shocked if Eydeth and half of his team weren’t currently hiding behind the thick shrubs just beside the open gate. Her suspicions were only confirmed when the tiniest rustle sounded from the bush closest to her. The leaves were thick enough to hide even the brilliant white Eydeth and his teammates wore, but Jahrra didn’t need to see them to know they were there. Now all she needed was a plan. Could she distract them somehow? If she had Scede, Rhudedth or Pahrdh with her, they might be able to pull it off. But her other friends were off trying to secure the flags belonging to the other teams. I hope they aren’t having the same trouble I am, she thought. Minutes passed and no one from any of the other teams came by. Jahrra wondered if they were too intimidated to attack Eydeth’s camp or if they were simply doing what she was doing: waiting and biding their time. Jahrra sighed quietly, her mind going back to the idea of making a run for it. She knew where Eydeth and his teammates were hiding, at least where some of them were hiding. She glanced back around the building. The shrubs were far enough away from the gate to prove a bit of a challenge if they were to try and shoot her from their hiding spots. Should I trust my instincts? she wondered. That they won’t shoot until I’m clear through the gate? Could someone be waiting on the far side of the field on the other side of the fence? Or will they just assume Ill run right in, not expecting an ambush? Jahrra chewed at her nails and felt herself growing restless. If I’m going to run for it, I had better have a plan of escape. She eyed the wooded hillside beyond the pasture. If she could somehow grab the flag, leap the fence and make it into the trees, then she stood a chance. Jahrra studied the far end of the fence line one more time. There. A weakness. The top rail had come loose from one of the posts and was resting on the ground. She could hurdle that, easy. And if she just simply applied some of the skills she’d learn from her elfin trainers, Yaraa and Viornen, this should be a walk in the park . . . if her enemies were exactly where she thought they were. It’ll be risky, she told herself, taking a deep breath and getting ready to bolt, but the reward will be so worth it. Jahrra stood up straight and took a deep, calming breath. She shoved the small crossbow into the quiver with the arrows and dye packs, tightened the straps, and shifted the bag so that it rested against her stomach and not her back. For what she planned to do, she needed her arms and back free. She took another deep breath, counted to three, and leapt into a full sprint. She quickly picked up speed, eating up the distance between the building she’d hidden behind and the wide open gate. Sixty yards, fifty, forty . . . She flashed through the gate, running at full speed and felt more than heard Eydeth and his comrades leap out of the bushes and run to close the gates. Jahrra kept going, grinning to herself. She had been right. The flag was waiting for her, only twenty yards ahead now, in the middle of the pasture. A golden tipped arrow struck the ground just to the right of her, its yellow dye splattering harmlessly on the grass as her boots sped past. Ten more yards . . . Another arrow chased her, this one landing between her feet, the dye just speckling her pants. Not a true hit, she thought to herself as she pumped her arms, her breath coming faster. The flag was only a few yards away, but Jahrra didn’t slow. She stopped moving her arms, but her legs kept up their speed. Just as she was about to pass the flag, she threw her arms forward, reaching out to grasp the wooden flag pole in one hand as she dived into a roll. Her fingers grasped the warm wood tightly as she tucked her shoulders and brought her head in to her chest. The back of her shoulders hit the ground with great force and the crossbow, in its bag with all the arrows, jostled about as she completed the roll, coming back up on her feet, her momentum barely changing. Without thinking, she tightened her grip on the flag, ripped free from its stone prison, and drove her legs even harder, aiming for the hole in the fence several yards ahead. A few more arrows flew past her, one of them making a full strike in the low of her back. Cursing inwardly, she forced herself to speed up, this time zigzagging a little as she ran. You can do this Jahrra! This is nothing compared to what Yaraa and Viornen make you do! She reached the fence, hurdled it with little effort, and continued sprinting up the rocky hillside, seeking the relative safety of the trees. Sweat poured down her face and her ribs ached from her hard landing, but she had Eydeth’s flag and nothing was going to make her stop now. Just as she disappeared behind the first row of trees, she thought she heard the livid scream of her nemesis at the far end of the pasture. Jahrra allowed herself a small grin, but she didn’t stop. She sprinted until she could hardly breathe anymore; moving deeper into the small copse but making sure she stayed within a hundred feet of the city’s outskirts. After several minutes she slowed down and quickly stripped the yellow banner from its pole and tucked it into her bag before picking up her pace once again. This time she would make an extra effort at returning to her own camp unheard and unseen. The last thing she needed was to get ambushed by another team and earn enough dye stains to make her effort at capturing Eydeth’s flag all for nothing. Jahrra spent an hour of slow and careful weaving through Aldehren as she made her way back to Gieaun and Kihna. Despite her effort, she’d been shot by someone on the blue team as she moved from a forested hill onto the streets, and then had a near miss when she paused to adjust the bag that carried her ammunition. After the second shot she had slowed her progress down even more. Won’t do any good if I keep getting shot, she grumbled to herself as she crept up to the boundary of her camp. Before coming within range of the redwood trees, Jahrra cupped her hands and imitated the call of a mourning dove. Four more calls greeted her and she eagerly jogged the final incline to find Scede and Rhudedth leaning against the trunks of the redwoods, both speckled with their own collection of dye marks, but grinning foolishly. She held up a green banner as her smile widened. “Excellent!” Jahrra cried as she pulled Eydeth’s yellow banner out of her bag. “We managed to steal three flags! ?” Scede added as he dropped the red banner on top of the others. “And managed to keep ours safe!” Kihna said as she climbed down her tree to join them. At that moment, another mourning dove call reached their ears and the five of them returned it, letting Pahrdh know it was safe to enter camp. He looked rather glum when he climbed up to the top of their hill. He appeared to have more paint marks on him than everyone else and he didn’t carry a blue banner in his hands. Jahrra frowned, studying the green, red and yellow flags. Gieaun was right. They had at least a few more hours left in the game and any one of the teams they had robbed could descend upon their camp at any moment to get back their flag and to take off with the others if they wanted to. It was one thing to guard one flag, but with four, every team would be after them. She pointed over at one of the clotheslines that hung lower to the ground than the others. When they had first picked this spot as their camp, Jahrra had been slightly concerned that someone might trip over the line in the heat of battle, but had since dismissed it from her mind. Now, as she ran her eyes down the rope, taking note of the colorful sheets and towels that hung there, she grinned. “Someday we’re going to have to pay for all our good luck!” she cried as she picked up the pile of stolen banners. The six of them spent the next several minutes arranging the stolen flags on the clothesline so that they blended in with the other towels, sheets and clothing. After that, they huddled around their own violet banner to discuss the plan for the rest of the day. “I think we should be done with hunting for more banners,” Pahrdh said with a hint of resignation. Jahrra thought this was a good idea as well, but she feared Eydeth had something more sinister up his sleeve. In the end, they went with Rhudedth’s plan and for the next hour, they managed to scare off the other teams as they shot at them from the cover of the redwood trees and the height of the hill. When Eydeth and Ellysian failed to show up, Jahrra’s nerves started to prickle. She called her teammates back down to talk it through. “I know they are planning something,” she said, her eyes scanning the shadows. Jahrra was almost shot five more times as she crept back through the city, searching for any sign of Eydeth’s team. Curse them, where are they?! Dread pooled in her stomach and sweat trickled down her back once again as she imagined that perhaps this had been their plan all along; to make her think they were plotting, only to sneak into her camp while she went out looking for them. Jahrra was just about to turn back when an arrow whizzed by her head, a flash of yellow catching her attention as it disappeared into a pile of hay. Mission accomplished! she thought as she sent a violet arrow towards one of Eydeth’s teammates before turning and running directly back towards camp. Jahrra turned to face the street below, one hand placed on her hip, the other letting her crossbow hang loosely at her side, as she donned a bewildered look. “Maybe they just left to scout the boundaries,” she mused in a not-so-quiet voice. In the next moment something hard smacked Jahrra on the side of the face, causing her head to whip to the side and her vision to become clouded with stars. What the . . . ? She quickly held her hand up to her temple and pulled it away to see if she was bleeding, but the moisture on her fingers wasn’t red, it was yellow. Hot anger welled up in her stomach as she snapped her head upwards. She scanned the bottom of the hill and was nearly hit again with another bolt. This one managed to graze her hair. She moved herself more securely behind the redwood, willing the pounding in her head and the ache in her temple to go away. Her eye was watering and she was livid, but she had to control her temper or Eydeth would get what he wanted. He casually stepped out from the behind the building he was using as cover. Unfortunately, it would still be hard to get a clean shot at him. He held his crossbow casually, another yellow-tipped arrow resting and ready to be fired. “There’s something nasty on your face and I was trying to kill it,” he sniffed. A torrent of chuckles answered him, all of them coming from the edges of Jahrra’s territory. She seethed in anger. There would most definitely be a bruise on her face tomorrow. No Jahrra, she thought as she ran the plan through her mind once more, just have patience. Just get him and his cronies to move in a little closer . . . Despite his assurance that she was alone, Eydeth stepped carefully up the hillside, his head swiveling in every direction as he checked for an ambush. Jahrra held her breath when he tried to peer into the redwood trees’ branches, but when his gaze returned to her, she let it out slowly. He hadn’t seen them . . .
“They didn’t leave me here!” she answered haughtily, hoping that her irritation would lead his thoughts in another direction. Eydeth relaxed a fraction and Jahrra took advantage of his claim. He turned back to face her, his eyes gleaming with malice as his sister and four of their friends stepped out from behind the buildings and climbed down from further up the hill. “You’re dead Nesnan,” Eydeth breathed as he lifted his crossbow and took aim once again. His teammates followed suit. “Oh, I don’t think so . . .” Jahrra muttered under her breath. “NOW!” she shouted as she quickly threaded her crossbow through her arm and threw herself into a back handspring. All of a sudden, the hillside was alive with arrows, their purple and yellow dyed tips marking the ground, the trees and anything else that got in the way. Jahrra managed to get to an oak tree just up the slope with only a few shots to the leg, but Eydeth and his team was faring far worse. “Where are the arrows coming from? !” he screeched as he searched the trees once again, backing up to take refuge behind the buildings. Jahrra managed to make it ten feet up into the tree before she stopped and pulled her crossbow off of her arm. She quickly readied an arrow and scanned the forest floor for possible targets, her grin growing wide when she noticed Ellysian retreating back up the hill. She was moving slowly, her eyes searching the redwood trees, so she didn’t see Jahrra following her progress with her own weapon. Ellysian’s back was to Jahrra, so she took a breath, aimed for a spot between her shoulder blades and . . . lowered her aim to the middle of her back, her lower back . . . When the arrow was lined up with a spot just below Ellysian’s tailbone, Jahrra released the arrow and relished the screech that ensued as the Resai girl went scrambling up the hillside, her backside splattered with dark purple paint. Two more purple smudges decorated her back before she found cover. 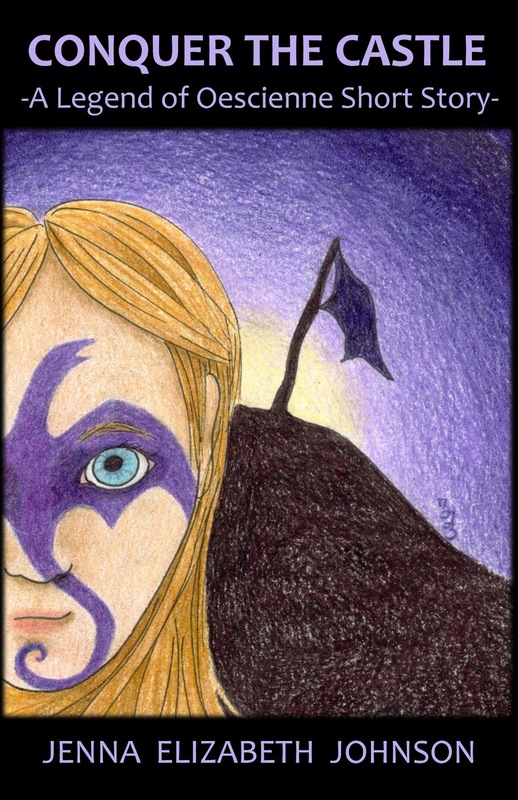 Remembering that they had a flag to defend, Jahrra whipped her head around and breathed a sigh of relief when she spotted the purple banner, standing proudly between the two redwoods. She had guessed correctly; their territory was too well defended for anyone to just run in and grab the flag. It wasn’t worth the risk when six people were shooting at them from the trees. “Retreat!” Eydeth screamed as he scrambled down the hill. Jahrra caught one last glimpse of him before he rushed out onto the cobblestones below with his teammates. She laughed out loud when she counted the paint marks on his back. Plenty to put their team out of the running. When they were certain that the enemy had fled their camp, the six friends climbed down from their respective hideouts: Gieaun, Kihna and Rhudedth from the redwoods and Pahrdh and Scede from the second story porches of the closest buildings. “That was fabulous!” Pahrdh proclaimed, throwing his arms in the air and giving Gieaun and his sister a hug. Scede looked as if he wished to extend the same gesture towards Kihna, but before he could decide, she made the decision for him. Jahrra hid a grin as she watched her friend turn bright red. Before any more celebrations could take place, the distant school bell began ringing. The six of them gathered their own flag and carefully removed the other three from their hiding places and ventured back towards the schoolhouse. They walked confidently through the center of town, though they kept a wary eye out for people seeking revenge. Luckily, there were enough adult volunteers around to catch anyone trying to cheat. The look on Eydeth’s face when they finally all gathered in front of the schoolhouse was worth all the hard work Jahrra and her friends had exerted that day. When he saw them, he glared maliciously, but all Jahrra did was smile widely and flap out his banner as if she were taunting a bull. He crossed his arms and darted his eyes in another direction, his face turning dark red in anger. It took Professor Tarnik and the adult volunteers a good twenty minutes to tally up all the points for each team. Jahrra patiently tolerated their examination, wondering if maybe she'd been hit more than she thought. The other teams, she had observed, looked just as messy as she and her friends did. Finally, Tarnik had all the tallies and he was ready to proclaim a winner. The clapping and cheering was louder this time, even though Eydeth’s team didn’t participate. Jahrra didn’t think his best wishes were sincere, but she smiled anyways as she and her friends started making plans for their day off. Hroombra glanced up from the manuscript he was reading when Jahrra clambered through the door. He was reclining at his great desk and had been waiting eagerly to hear how she and her friends had fared in their game, though one would not know it from his relaxed posture and calm gaze. It wasn’t quite full dusk, but Jahrra started lighting candles anyways as she made her way across the room. The dragon eyed her curiously as she approached. “I see you were hit,” he mused, a grin tugging at the corners of his mouth. She beamed blissfully, recalling the events of the past several hours. Jahrra almost snorted at the sudden memory of hitting Ellysian right in the seat of her pants. Oh, what a glorious day it had been! Jahrra finished with the candles and walked over to the great dragon, pulling up a chair and plopping down in it across the desk from him. She was exhausted, grimy and ready to fall asleep where she sat. She leaned back in her chair and held out her arm, examining the loose sleeve of her shirt. There were a few multi-colored stains there, but they had transferred themselves from her legs and torso. She knew she had at least three marks on her back, two on her stomach, one on her shoulder and hip, and several more on her legs. Yes, it had been a rather exhausting day. Grinning, Jahrra leaned forward and stared at her guardian. He politely ignored her, his great amber eyes moving back and forth behind his spectacles as he read away. Hroombra pressed his great hand against the scroll he was reading and looked up at her, brow arched. He took off his spectacles and placed them aside, giving her his full attention. Jahrra’s eyes grew wide. Wait, he’s actually going to tell me? Really? Jahrra choked on her words for a few moments as they tried to fight their way free. “Was he a noble?” she blurted. Eyes glittering and his mouth quirked in a small smile, Hroombra nodded once. “How old was he when he wore these?” she continued, pulling the dirty shirt away from her stomach. Hroombra gave a full smile, but Jahrra thought she saw a hint of sadness in his eyes. Jahrra was about to ask what had happened to him, but thought better of it. Perhaps he had moved on when he was too old for a dragon mentor anymore. Or perhaps he had fled in fear when dragons were adopted as the enemy throughout their world. Maybe, judging by her guardian’s moment of sadness, something even more tragic had occurred. Jahrra opened her mouth to ask something else, but tripped on her tongue when what Hroombra had said registered. Jahrra screeched and bolted from her chair, heading for her room. She didn’t even hear Hroombra’s chuckle trailing after her as he got back to his manuscript. If you've enjoyed this short story, please check out all of the Oescienne books on the Legend of Oescienne page of this blog, visit http://www.oescienne.com/, or go to Smashwords to get your FREE digital copy of the first book in the series, The Legend of Oescienne - The Finding.